ARRESTED FOR FEEDING THE HOMELESS! When officials in the tiny Town of Stettin in Marathon County went to collect a civil judgment from 75-year-old Roger Hoeppner this month, they sent 24 armed officers. And an armored military vehicle. Dave Acton covers in this quick synopsis the fact that there are considerations about strike teams being deployed for the Ebola issue, which in fact would directly violate the posse comitatus act. Armored military vehicles of the type used to hunt for insurgents in Afghanistan are set to patrol roads in Sheboygan County, Wisconsin as part of a training exercise on behalf of the U.S. Army Reserve. “(Capt. William) Geddes said the U.S. Army Reserve wanted to alert the public to the training dates so residents are not alarmed when a pack of heavily armored military vehicles is driving around the county,” reports Sheboyganpress.com. The exercises are being run despite the fact that troops driving the M1117 Armored Security Vehicles have already received their basic training. “They’re vehicles that these military officers might use if they’re deployed, patrol vehicles,” Geddes said, adding that the drills were to ensure that officers didn’t get “rusty” in handling the M1117s. The vehicles, which have been used overseas in Afghanistan, are described as being “strange,” “intimidating” and “heavily armored,” while being the same size as a large SUV. Local authorities have apparently not even been briefed about the planned exercises, which will run until August 17. “Sheboygan County Administrator Adam Payne said he had not heard about the training exercises. Two city officials declined to comment, because they also had heard nothing about the training,” states the report. Geddes urged citizens not to create safety hazards on the roads by stopping to gaze at the vehicles. The increasing phenomena of military training drills taking place away from military bases and amidst the general public has led to fears that the American people are being acclimatized to accept a potential future declaration of martial law. 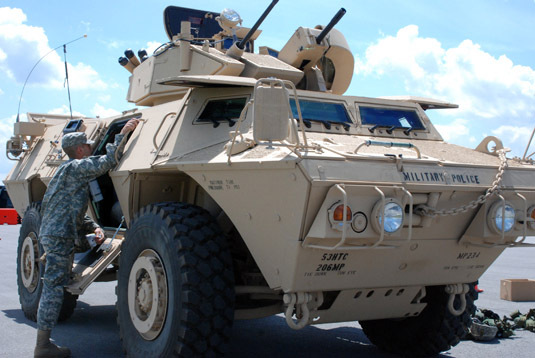 Back in June, residents in St Louis were shocked to see heavily armored U.S. Army vehicles patrolling neighborhoods as part of an exercise. [NaturalNews] There are times when, despite the potential seriousness of a crime, a little compassion is in order for those and their families, for children cannot be held responsible for the crimes of their parents. They especially should not be made to suffer if their parents are actually innocent of any crimes. So it’s with no small helping of disdain we bring you the story of a wrongly accused suspect whose family was made to suffer needlessly because a St. Paul, Minn., storm-trooper drug task force kicked in the wrong door. According to a lawsuit filed in federal court in Minneapolis, members of the St. Paul Police Dept. drug unit broke down the door to the home of lead plaintiff Roberto Franco and shot the family dog before handcuffing all nine occupants – including three children – who were then forced “to sit next to the carcass of their dead and bloody pet for more than an hour.” The suit states the anti-drug team continued to search Franco’s property even after realizing they raided the wrong house. It used to be, in America, that you were innocent until proven guilty. Even taking into consideration the dangerous nature of police work, the very act of storming someone’s home to make an arrest presumes guilt more than it recognizes a potential danger, making goofs like kicking in the wrong door all the more heinous. Adding insult to injury by cuffing kids and making them sit next to the family’s dead dog is just despicable. You can’t make this stuff up. The suit, filed against the officers of the Dakota County Drug Task Force, the St. Paul Police Department, and a federal Drug Enforcement Agency officer who was along for the ride apparently, claims essentially that the task force raided the wrong house, noting that the squad should have gone next door. “Defendant Scovill lied when he informed the District Court judge who reviewed Scovill’s search warrant application that Scovill had obtained information from the confidential informant that the plaintiffs’ home was the properly targeted house and that the address and the identity of the individuals who resided therein were the plaintiffs,” it says. The complaint says the suspect named in the warrant is one Rafael Ybarra; Franco wasn’t named in the search warrant at all, nor was anyone else living in the home, making the resultant hour-long search of his premises even more difficult to understand. “There was never a mention of the plaintiff, Roberto Franco, in any documents related to the raid search warrant,” says the complaint, adding that Franco “had never been discussed or considered a suspect by law enforcement, Scovill, or any of the defendants directly or indirectly involved in the raid, relative to any alleged involvement by Franco in any distribution of contraband prior to the wrong house raid. Officers burst through Franco’s door on the night of July 13, 2010. The complaint said the team acted “negligently” in “raiding the wrong home,” charging officers with “brutalizing” all of the home’s occupants. The suit seeks $30 million in compensation for civil rights violations and punitive damages. In Camp Pendleton, California, the Marine Corp have created a law-enforcement battalion (ELB) consisting of specialized military police officers (SMP) that will be deployed to assist in investigating crimes dealing with drug trafficking, train security and terrorism. The ELBs contain an estimated 500 SMPs and trained dogs. While capitalizing on their investigative and police training, they will take the role of current street cops while still remaining part of the Marine Corp.
Having been deployed overseas prior to their new placement, these SMPs will secure evidence and assist local police departments in building cases against predetermined criminal networks. They may even conduct raids in cities and add to the show of force that is now being used to intimidate the average citizen. 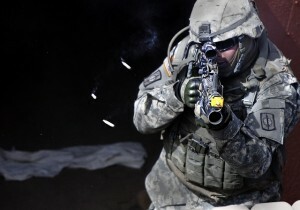 Last June, the Department of Defense began testing military drills in Missouri. While local residents of St. Louis City were warned not to be “alarmed” as US Army tanks travelled down residential neighborhoods. They were told that this is not the beginning signs of martial law. You are currently browsing the archives for the Police State & Police Brutality category.